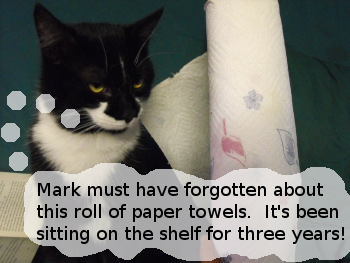 Is there life after paper towels? I quit using paper towels ages ago. Mainly because I never could remember to buy them. I like flour sack towels. They last forever and a day and soak up anything. And for the bacon dripping newspapers... boy! They are really great as fire starters in the woodstove! Sounds like if your name starts with "jen", then paper towels are out. I really like the idea of reusing oil-soaked paper for a firestarter --- Mark likes to buy those fire starter logs for really damp days, but I'd like something less storebought.